Decorative lotus measures 1” x .75”. Our jewelry always comes boxed and ribboned. Handmade Matte Sterling Silver Lotus Shaped Earrings. Earrings are 2” long and about 1.5” wide. Made by Julia Britell, a jewelry artist based out of the Berkshires of Massachusetts. 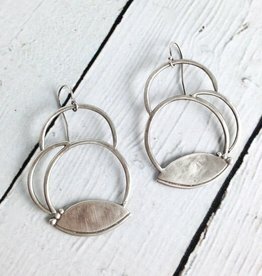 Handmade Matte Sterling Silver Circles with Lotus Petal Earrings. Earrings are about 1.75” long and 1.25” wide. 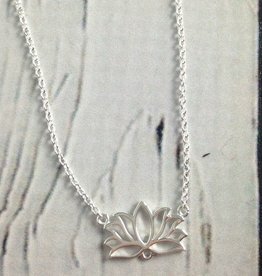 Handmade Matte Sterling Silver Lotus on Double Strand Necklace. 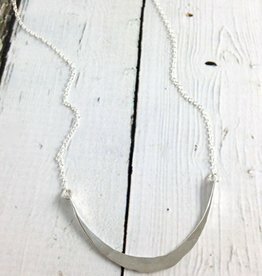 Necklace sits at 15” and 16” and can be worn with it’s 2” extension to make it 17” and 18” and it’s longest point. Pendant measures 1.75” x .1.5”. 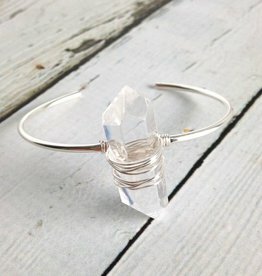 Handmade Silver Rhea Bracelet. Bracelet is 6”. Crystal measures approximately 1.5” x .5”. Our jewelry always comes boxed and ribboned. We are happy to offer free gift wrap upon request, simply leave us a note at checkout! 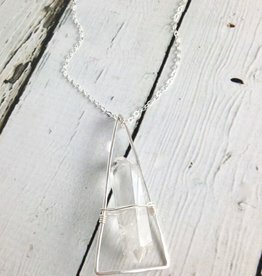 We love the look of these clear quartz stones on long necklaces. They look great with everything in your wardrobe! Pendants measures 2” x .5”. 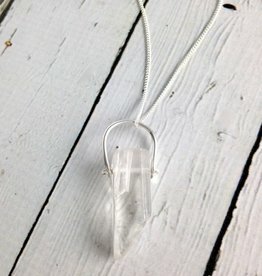 Handmade Silver Raw Crystal Necklace. This is a total statement necklace. 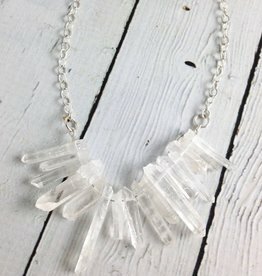 We love that the clear crystals make this necklace perfect for dressing up or down with any color or pattern. Pendant measures 2.5” x 1”. 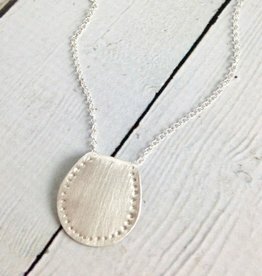 This necklace is the "minimalist" look at it's best. It's like a wearable piece of modern art. Pendant measures approximately 2.5” x 1.35”. 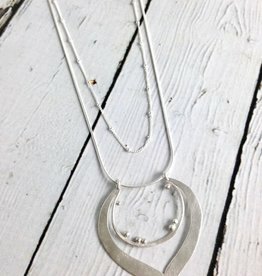 Half moon shaped pendant that does a sort of twist on each end. Looks super cool on! Pendant measures 2.35” x 1.25”. This necklace makes a statement on it's own! Looks great with scoop necks, crew necks and really great with button downs! Pendant measures approximately .9” x .8”. 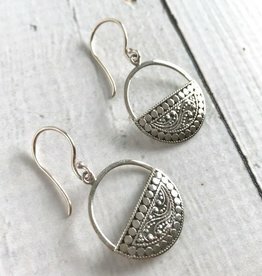 Earrings are naja and/or half moon shaped. Earrings measure .4” x .4”. Sterling Silver Granulated Rays Earrings with Round Turquoise. Vintage style setting makes these super unique. Earrings measure .75” x .6” . All of our jewelry is gift boxed and ribboned, prefect for presenting to your loved one. 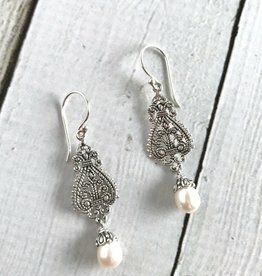 Sterling Silver Ornate Design Earrings with Pearl Drop. These earrings have a very vintage vibe. Perfect for a fancy evening! Earrings measure about 1.5” x .5”. 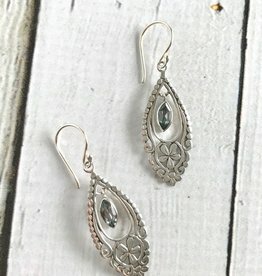 Sterling Silver Hammered Teardrop Fancy Earrings. Simple enough for everyday but they still have that edgy coolness to them with the hammered silver and top filagree design. Earrings measure 1” x .65”. 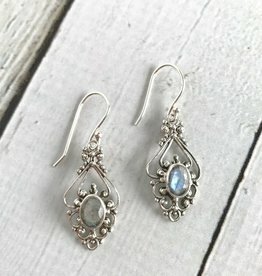 Sterling Silver Ornate Granulated Earrings with Rainbow Moonstone. 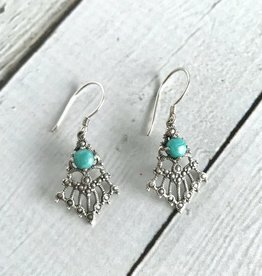 These earrings look vintage and magical all at once! Earrings measure 1” x .5”. Sterling Silver and Blue Topaz Earrings. 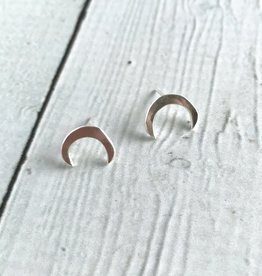 Earrings are teardrop shaped. Topaz stones are marquise cut. Earrings measure about 1.25” x .6”. 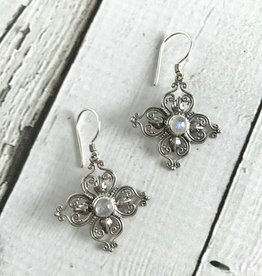 Sterling Silver Stylized Flower Earrings with Round Moonstone Center. 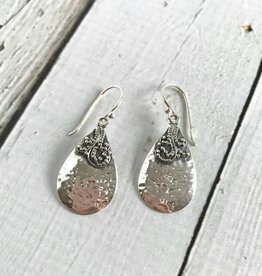 Intricate silver design on each petal makes these really special. Earrings measure about 1.15” x 1.15”. 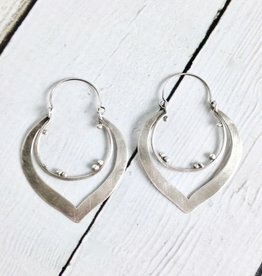 Silver Round Bottom Half Design Earrings. 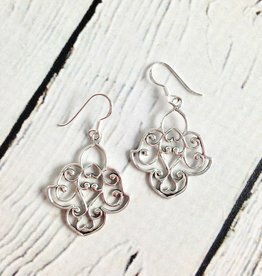 Half of these earrings is filled in with an intricate silver design that is just beautiful. Earrings measure .75” x .75”. 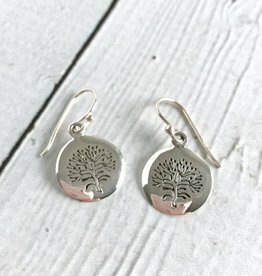 Silver Round Stamped Tree Earrings. 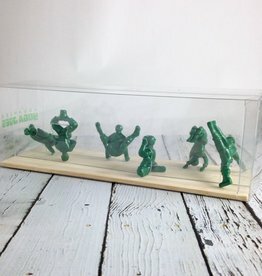 Perfect gift for the nature lover in your life. Earrings are about .5” x .5”. A perfect small lotus charm hangs on a silver chain necklace. 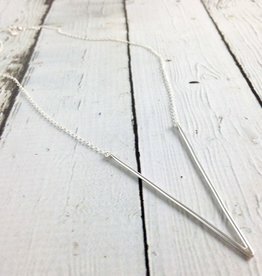 This lovely sterling silver necklace is 16" long with a 2" extension. Features a white bead charm on the end and lobster clasp closure.